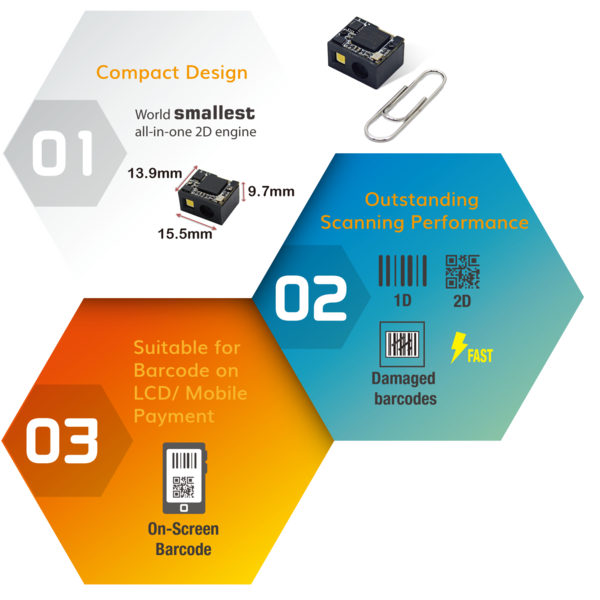 As the fastest growing China Retail Barcode Reader Suppliers, Newland is constantly committed to product development and innovation. Today, Newland releases a brand-new Barcode Scan Engine - EM3080-W.
EM3080-W with integrated design takes up a small space and enables flexible arrangement in the device. Fast decoding capability with wide scanning angle gives EM3080-W excellent close-range barcode scanning performance. EM3080-W can replace Newland EM3080, a popular barcode scan engine. Compared to EM3080, this brand-new module EM3080-W has obvious advantages: larger scanning angle, lower energy consumption and more affordable price. For users who have used EM3080, EM3080-W is compatible with EM3080 in mounting aperture, commands, etc., making the upgrading of integrated device’s performance a breeze. Today, 2D barcode has penetrated into every aspect of our lives, from mobile payment to self-service terminals, from warehousing to medical service, and a small block diagram stores a lot of information. To read this information, a 2D barcode scan engine is essential. As the world’s smallest 2D barcode scan engine, EM3080-W offers great flexibility in a variety of possible applications. It can be easily embedded in a variety of devices that need to scan barcodes, including print barcodes, especially on-screen barcodes, to achieve fast scanning and provide efficient service for customers.